The tale of the 1914 Christmas Truce survived through the letters and photos of soldiers who, along 600 miles of trenches, suspended war and shared Christmas - with their enemy. The war to end all wars did the opposite, sowing seeds of future ones. Industrial warfare - bombing cities; using chemical poisons; and a punitive peace treaty, with the winners dividing up the empires of the losers - all but guaranteed that future conflicts would be settled by military force. Painting by Angus McBride, . Along the western front of World War I lie miles of cemeteries for British, Scottish, Belgian, French and other soldiers killed in the war. In a lone, out-of-the way plot in this land of teenage war dead, a large cross and a dozen small ones honor the Christmas Truce of 1914 spontaneously celebrated by soldiers, and even some officers, on both sides of the war. By five months into the merciless war, they were living in freezing trenches with corpses and rats that fed on the dead; facing each other through rows of barbed wire; and exposed to artillery shells, machine guns and, later, poison gas. The tale of the 1914 Christmas Truce survived through the letters and photos of soldiers who, in many locations along 600 miles of trenches in Belgium and France, suspended war and shared Christmas, like brothers, with their enemy. One story tells of a young German soldier singing Stille Nacht (Silent Night) on Christmas Eve and, from nearby trenches, other soldiers joined in their own tongues. What followed was the most unique of nights in the history of war: Soldiers on both sides lay down their weapons, crossed over barbed wire and shell holes and greeted each other with their Christmas gifts of food, beer, champagne and schnapps. Together they buried corpses of the fallen that lay in the narrow no-man's land between them, played soccer with tin cans and straw-filled sandbags for balls, sang carols, took photos, and exchanged mementos and addresses. Fraternizing like this is treasonous because it undermines war morale and the indoctrinated will to kill. 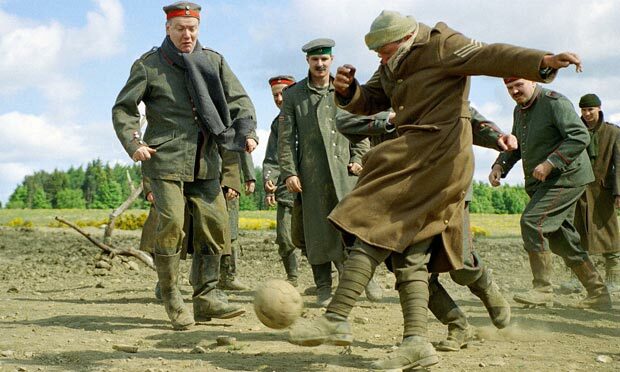 And thus, military authorities anticipated and suppressed a Christmas truce with "the enemy" the following year. Erich Maria Remarque enlisted at 19 in the World War I German Army. Quickly he saw that a sense of ideal and almost romance of war, instilled by the state's propaganda campaign, turned high school boys like him into willing recruits for slaughter. Some 10 years after the war's end, he published his first (and what some consider the greatest) anti-war novel, *All Quiet on the Western Front. * Remarque's 19-year-old soldier and central character of the novel acutely observes the corrupt dynamics of war: "I see how peoples are set against each other.foolishly, innocently, obediently slaying each other. While they [the careerist politicians and the media war boosters] continue to talk and write, we saw the wounded and dying.The wrong people do the fighting." In perhaps the most incisive moment of this novel, a young German soldier gazes upon a young French soldier he has killed and ponders their common humanity. "Why do they never tell us that you are poor devils like us, that your mothers are just as anxious as ours, and that we have the same fear of death, and the same dying and the same agony." This war to end all wars did the opposite: It sowed the seeds of future ones. The model of industrial warfare - bombing cities; employing chemical poisons; and a punitive peace treaty, with the winners dividing up the empires of the losers - all but guaranteed that future conflicts would be settled by military force, not skilled diplomacy and politics. George Ball, who served in the State Department under Presidents Kennedy and Johnson, observed that no one in those administrations was assigned to study a diplomatic solution to end the Vietnam War. In 1963 and again in 1967, President Charles de Gaulle of France offered to mediate a truce; but the United States was determined to win militarily, lest a defeat or stalemate be perceived by the world as weakness and, thus, embolden Communism. Millions of Vietnamese and tens of thousands of Americans lost their lives senselessly for U.S. image in the world, image ultimately tarnished by the extreme brutality of our war on a small, poor country of peasants. The seeds of our most recent military intervention into Iraq and Syria, with aerial bombing and now some 3,000 soldiers on the ground to defeat the lawless and sadistic ISIS, were sown during the recent Iraq War. This 8-year war, built on a base of deceit and lies, left Iraq a failed state and a bitterly divided country in which up to one million of 24 million people died, millions left as war refugees, and women's equality was set back decades. A breeding ground, in other words, for terrorism. The youthful soldiers' truce on Christmas 1914 was but a moment of sanity in the adult men's insane war fought for empire and reckless power alliances. May their inspired act be - 100 years of war later - a beacon for diplomacy and political solutions. "For what can war but endless war still breed." [Pat Hynes, a former Professor of Environmental Health at Boston University School of Public Health, directs the Traprock Center for Peace and Justice. "When the Christmas bells sounded in the villages . behind the lines . something fantastically unmilitary occurred. German and French troops spontaneously made peace and ceased hostilities; they visited each other . and exchanged wine, cognac and cigarettes for Westphalian black bread, biscuits and ham," a German soldier, Richard Schirrmann, wrote of a memorable event in the First World War. This spontaneous truce took place on Christmas 1915, a year after such truces sprang up in so many places where armies of several nations were faced off in trenches bristling with massed rifles and machineguns backed by artillery barrages that the world war Christmas Truce was enshrined in history books. One hundred years later, this soldiers' truce is being commemorated big time in England, which lost a generation of men in the war. Speaking at the unveiling of a statue at the National Memorial Arboretum, Prince William lauded the story of the Christmas Truce. "We all grew up with the story of soldiers from both sides putting down their arms to meet in no man's land on Christmas Day 1914 - when gunfire remarkably gave way to gifts," he said. "It remains wholly relevant today as a message of hope and humanity, even in the bleakest of times," reported the Daily Mail. The statue's design of two clasped hands inside a soccer ball frame commemorates accounts of British and German soldiers singing familiar carols across the battlefield, then climbing out of their trenches, exchanging gifts and playing football or soccer. In commemoration, this year British football leagues organized Football Remembers events involving thousands of professional, amateur and youth football players. Information packets about the historic significance of the Christmas Truce were sent to more than 30,000 schools, the BBC reported. This story has yet to stir much interest in the US, aside from an Associated Press story picked up by The Salt Lake Tribune. "This Christmas, the British supermarket chain Sainsbury's has taken the idea and turned it into a blockbuster ad, showing opposing soldiers living the truce amid a football match at the center of the heart-tugging, some say sanitized, view of that Great War day," the AP noted of a stunning video that has been circulating on Facebook. Meanwhile, the news agency continued, "Michel Platini, the president of Europe soccer's governing body, underscored that unique mood of brotherhood at the unveiling of the Christmas monument on Thursday on the former battlegrounds known as Flanders Fields in western Belgium, scene of some of the most horrendous killing. The monument is a steel ball sitting on the remains of a World War I shell." But some Americans get it. Singer-storyteller John McCutcheon is performing a series of "Christmas in the Trenches" concerts this month in Knoxville, Seattle, Kansas City, and New York. As the Seattle Times reported today, "McCutcheon's most treasured memory of `Christmas In the Trenches' having a real impact comes from a concert he gave in Denmark 30 years ago. "'I met four German men who traveled from Berlin because they'd heard the song on the radio and wanted to meet me. They were in their late 80s and had been a part of the Christmas Truce. They were just kids when it happened. They'd tried to tell people about it and weren't believed. I was gobsmacked that they wanted to thank me,' he recalled." McCutcheon's tribute to the World War I truce will be the highlight of his "Christmas in the Trenches" concert at the Great Hall of The Cooper Union in New York on December 20. McCutcheon's audience will include many veterans who fought in numerous wars since The War to End All Wars. The 7:30 pm concert is sponsored by the Veterans Peace Council of Metro New York, whose member organizations include Veterans For Peace, Vietnam Veterans Against the War, Iraq Veterans Against the War, Military Families Speak Out, and Friends and Family of the Abraham Lincoln Brigade. The veterans' groups issued a public call: "ON THE CENTENARY OF THE 1914 WORLD WAR I CHRISTMAS TRUCE, LET'S HONOR THE PEACEMAKERS AND BUILD A PEACE TO END ALL WAR!" Hopefully, this centennial call will be heard in this season of Christmas celebrations, amid seemingly endless US military operations in the Middle East, Afghanistan and elsewhere.